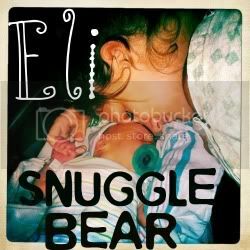 Snuggle Bear Eli: Counting the minutes..
My day seems to drag on FOREVER. I run out of things to do with Eli so I find myself walking around my tiny apartment just to pass the minutes by. By time 11am rolls around I'm done with all my cleaning and laundry for the day. So... I just rotate Eli from his play mat, to his bouncing chair, to his swing, then finally his toys. 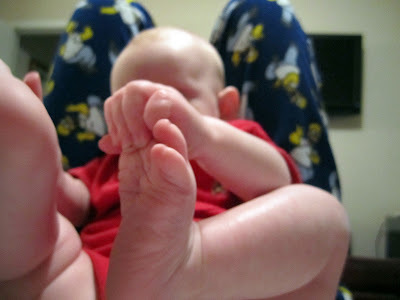 (He's just about too big for his swing and bouncing chair!) This process is repeated till my dad finally comes home at 4:30. Then I find myself hanging out in his room chatting about nothing waiting for Eli's bed time to come. I'm insanely bored. I desperately need some tips to help the day go by faster. I want to be productive I just don't freaking know what to do!! I know, I know... "This too will pass". but in the mean time... any ideas?